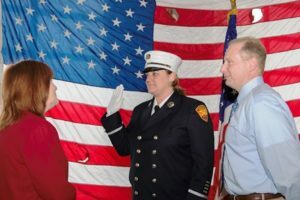 Northborough – Northborough resident Susanne Crippen was promoted to lieutenant at the Framingham Fire Department during a formal swearing- in ceremony May 6. She also makes history as the first female to earn this rank in the department. 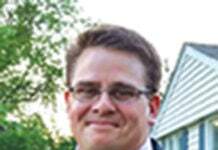 “Being promoted is a huge deal and it’s an honor to be lieutenant for the department,” Crippen said. 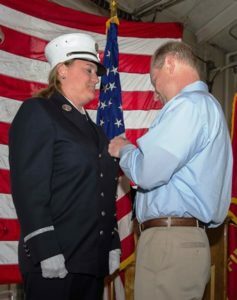 In her new role, she will be in charge of an engine company that includes three other firefighters on the team. Crippen is one of three female firefighters in Framingham and appreciates the confidence her department has in her. She has also been able to be a presence in the schools while teaching students in the Student Awareness of Fire Education (S.A.F.E.) Program, which has a mission to enable students to recognize the dangers of fire. She noted, however, that being a firefighter is not for everyone. Previously, she worked as a police/fire dispatcher but chose her career with the fire department because of the ability to help people more. She not only responds to medical calls and fires, but also to residences that are having issues such as fire alarms not resetting. 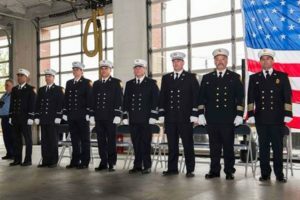 The civil service process is used to hire for the fire department which involves an exam process resulting in a list of candidates and an interview. 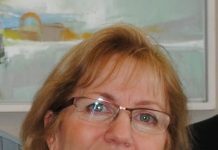 Crippen attended Framingham State and earned her master’s degree in public administration from Anna Maria College. 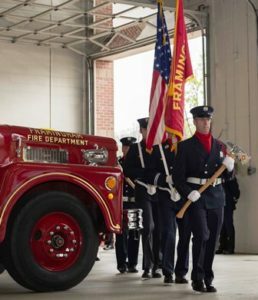 She attended the Massachusetts Fire Academy and has been with the Framingham Fire Department since 2007. 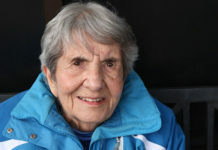 She was always been involved with playing sports through school, such as volleyball and softball. 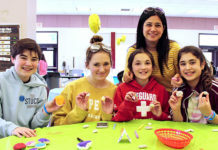 She feels that being part of a sports team helped her learn the importance of team effort and the skills that she uses every day on the job. 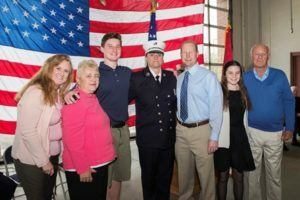 Her fire department team is like her family away from home. When she isn’t fighting fires, she enjoys the time with her husband Tom, and her other full time job as mother to children Gregory and Karoline. Tom Crippen pins the lieutenant shield on his wife.